ACC with LSF indicator goes off. 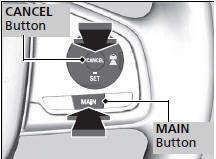 When the LSF function has stopped the vehicle, you cannot cancel ACC with LSF by depressing the brake pedal. Resuming the prior set speed: After you have canceled ACC with LSF, you can resume the prior set speed while it is still displayed. Press the RES/+ button. The set speed cannot be set or resumed when ACC with LSF has been turned off using the MAIN button. Press the MAIN button to activate the system, then set the desired speed. When the radar sensor in the lower bumper next to the fog light gets dirty. The vehicle ahead of you cannot be detected. An abnormal tire condition is detected, or the tires are skidding. Driving on a mountainous road, or driving off road for extended periods. When the ABS, VSA or CMBSTM is activated. When the ABS or VSA system indicator comes on. When the vehicle is stopped on a very steep slope. When you manually apply the parking brake. When the detected vehicle within the ACC with LSF range is too close to your vehicle. The ACC with LSF automatic cancellation can be also triggered by the following causes. In these cases, the parking brake will be automatically applied. The driver's seat belt is unfastened when the vehicle is stationary. The vehicle stops for more than 10 minutes. The engine is turned off. Even though ACC with LSF has been automatically canceled, you can still resume the prior set speed. Wait until the condition that caused ACC with LSF to cancel improves, then press the -/SET button.